This is a story about serendipity, love, generosity. And the house which inspired it all. 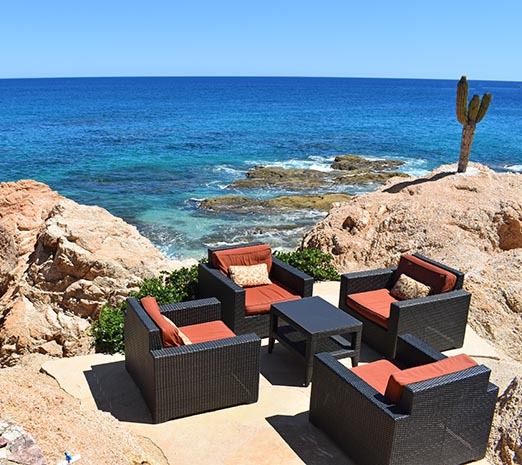 That would be Villa Cielito, meaning “a little piece of heaven”, a great name for a great house, sitting on a dramatic, rocky point overlooking sea and sand at beautiful Chileno Bay on the Cabo corridor. 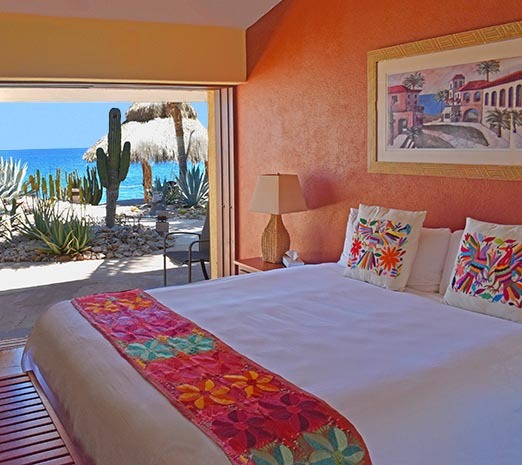 Where constant breezes ruffle tall palms, sea birds fly low and the sound of waves forms the backdrop to your day. 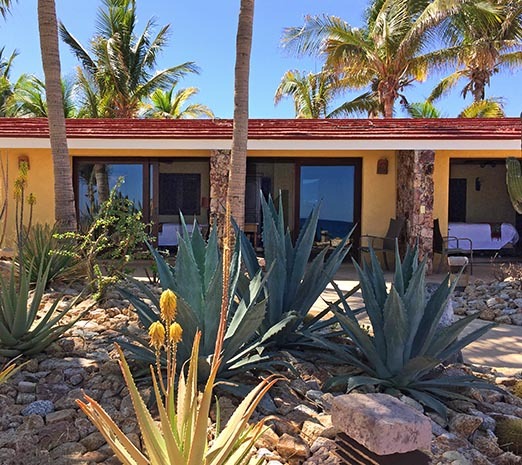 Designed in the early 1960s by Cliff May for pioneer developer Bud Parr, Villa Cielito exemplifies the look and feel of early Cabo, when it was an exclusive getaway for movie stars and celebrities drawn to the area’s natural beauty and great fishing. With clean lines, a long, low profile and wide open floor plan, the home is very much in the California Ranch Style that May created. 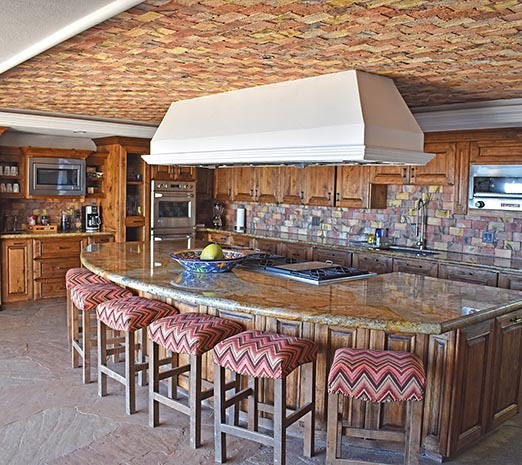 Large stone walls and wooden ceiling beams add Mexican hacienda touches, giving it a classical yet modern appeal. 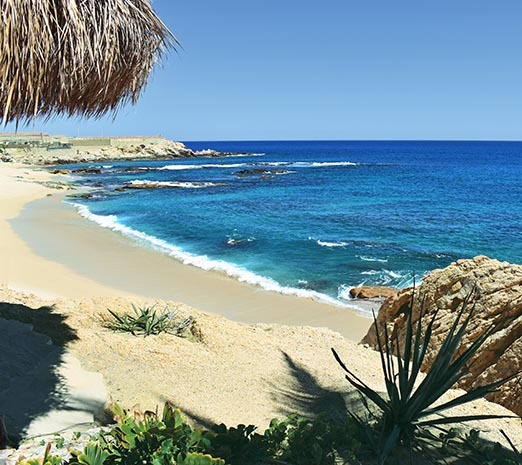 The icons of this period are gone now, casualties of time and development: The Twin Dolphin, Hotel Hacienda and Hotel Cabo San Lucas, another Bud Parr-Cliff May collaboration on Chileno Bay. 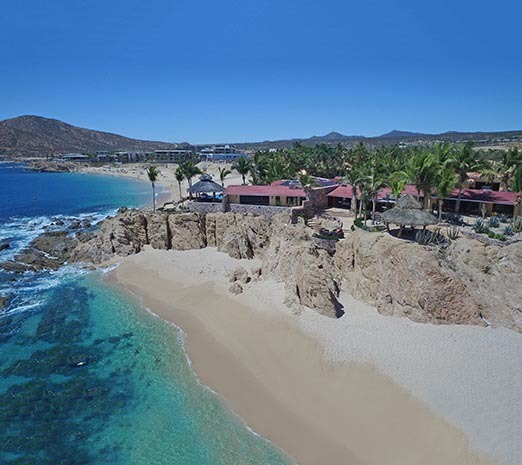 The Cabo corridor in particular is experiencing great transformation, as luxury hotels and big development projects take over the skyline. 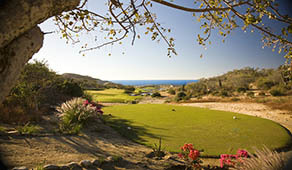 Much of Chileno Bay itself is now a Discovery Land Company community, with exclusive residences, beach club, hotel and Tom Fazio golf course under construction. 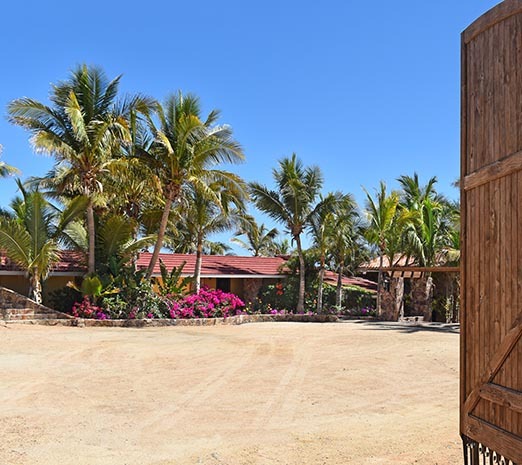 Steadfast in the midst of all this change is Villa Cielito, the lone survivor, a tranquil, palm-dotted oasis of old world splendor and romance. 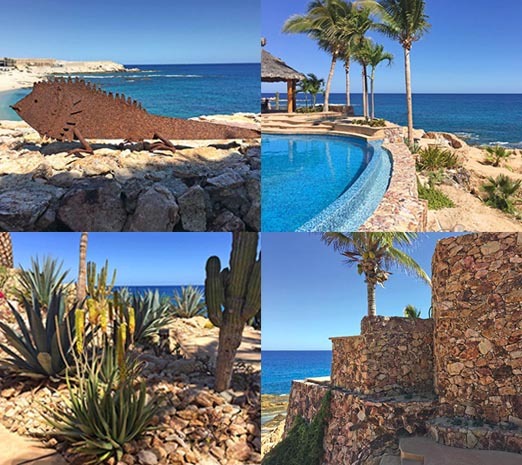 Back in 1991, Villa Cielito was simply Casa Ocho (#8), last in a row of 8 vacation rentals built by Bud Parr that stretched along Chileno Bay from Parr’s Hotel Cabo San Lucas. 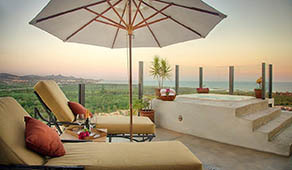 Dicko and his wife Debbie, the Villa’s owners, were vacationing with their family next door in Casa Siete (#7). Instead of their usual family trip to Hawaii, they had decided on a week in Cabo. It was a good choice; everyone was having a great time. Except for Dicko’s father, who was bored. 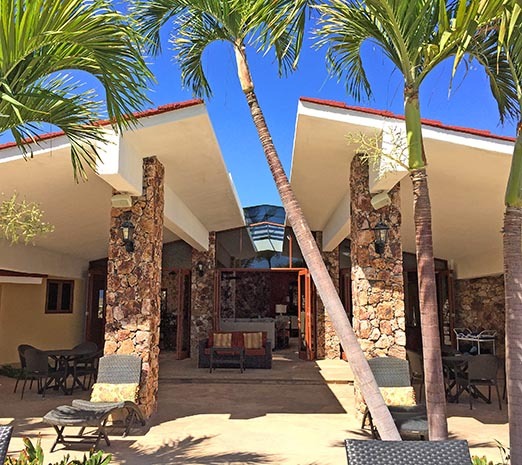 To amuse himself, he decided to look for property in nearby Santa Maria Bay. 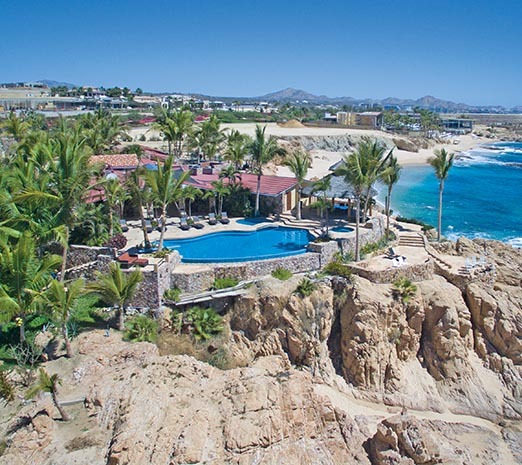 Shortly after, a young man knocked on their door and introduced himself as the manager of the Hotel Cabo San Lucas. They hit it off immediately and became good friends, spending the days together in the water and on the beach. On the sixth day, the last day of their trip, another visitor came to the door. This time it was none other than Bud Parr himself. The family was stunned. Their new friend was actually Mitch Parr, Bud’s Parr’s son, who had been sent by his father to check them out! Parr had heard from the realtor that the family was looking for property, and wanted to see if they were the right people for Casa Ocho. There must have been magic in the air that week. 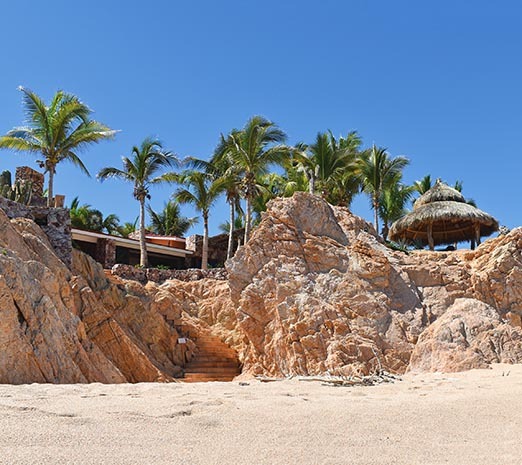 Or perhaps it was just how much the family loved Chileno Bay, enjoying everything the beach, the ocean and reef could offer. But Parr’s proposition was not without its drawbacks. The house had been shuttered for 10 years and had fallen into disrepair, consequence of a stalled business deal. Nothing worked, there was no electricity and some walls were missing. In spite of these problems and beyond the obvious attractions of an idyllic setting, there was something compelling about the house itself- “great bones”, a “diamond in the rough”. So they said yes and sold their vacation place in Hawaii. It would take nearly 3 years to get the house back in order. For the new owners, the restoration became a labor of love, a mission to update to the fullest potential while preserving the essence of May’s vision. To their credit, they have been largely successful. You would never guess that these features came later: sliding pocket doors; flagstone floors; big swimming pool instead of a mini pool; new cooling system; updated master suite with improved views. 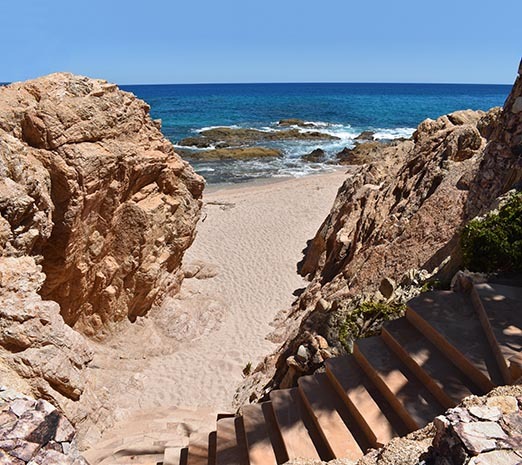 Even stairs carved into the rocks are the result of a summer’s work to make a path to the beach and to give the kitchen an ocean view. The 7,000 sq. 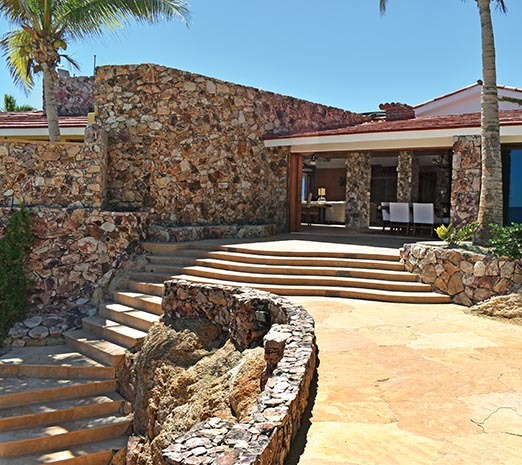 ft. house sits on a spectacular 2 acre outcropping that at its extreme, extends to the water and bifurcates Chileno beach. It has a simple, Y-shape plan to allow every room an ocean view. A combo of stone, wood and concrete gives a natural, organic feel to the design and blends harmoniously with the rocky site. You pass through big wooden gates into a simple courtyard edged with palm trees and bougainvillea. 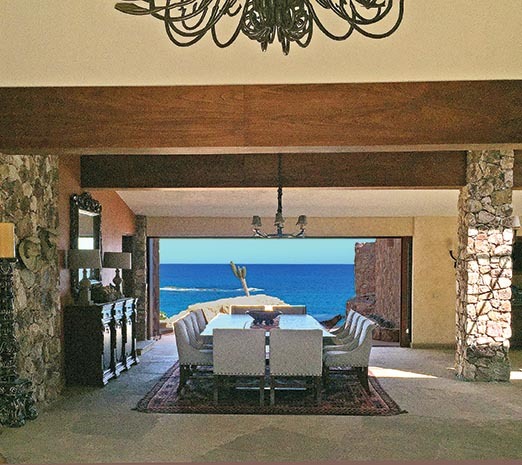 Enter the living room and you are startled by the incredible view of an intensely blue ocean framed by large, open pocket doors. A dining table made from a giant slab of wood sits in front. This is a big, airy, open space with high, vaulted ceilings supported by stone pillars and wooden beams. A narrow skylight shoots across the peak of the ceiling, drawing the eye upwards and out towards the main patio and pool area. 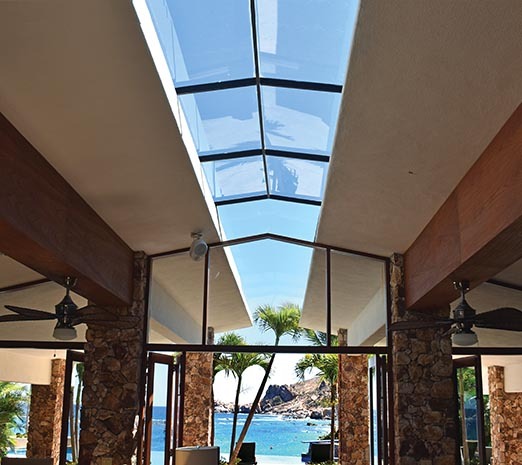 Here the roof extends beyond the skylight over the patio to create a covered lounge area. This split in the roof creates a very interesting visual. 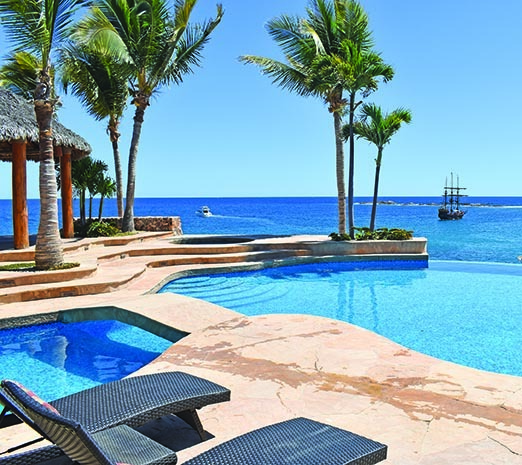 Two wings of the house lead off from the pool and patio area, each end with its own palapa. To the right are a row of 3 bedrooms with en suites. To the left, behind a private entry, is the master suite, kitchen and 3 more bedrooms with en suite bathrooms. All, even the kitchen, have pocket doors and ocean views. But the living room, architecturally the most spectacular, is still the main room of the house. 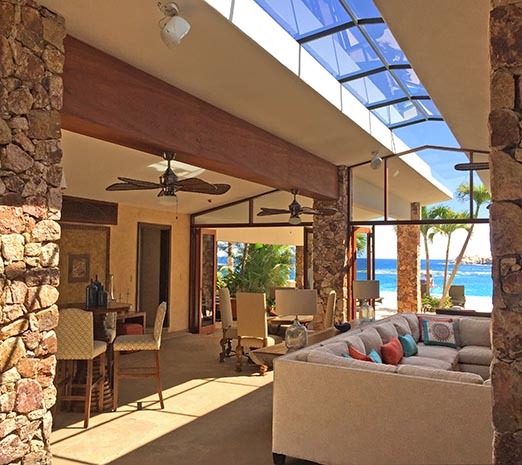 Its open floor plan and easy flow to the exterior is perfect for Cabo’s casual lifestyle. Its interesting to see design concepts we value today, like the open floor plan and indoor-outdoor living, in a house that was built nearly 60 years ago. 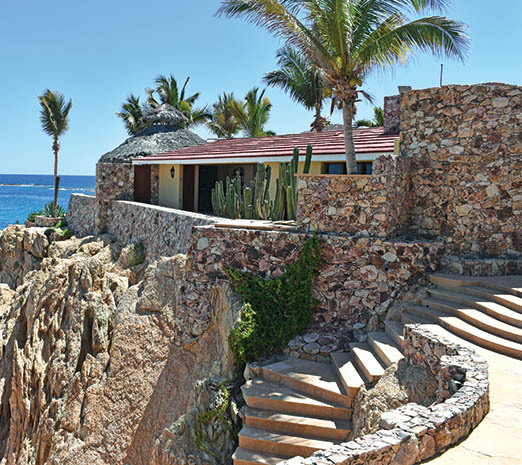 Along the ocean facing side of the house, descending at different levels into the rock, are little sitting areas, each offering a different perspective of the coastline and the bay. It was explained to me this way: cigars in the lounge area in front of the kitchen, breakfast under the small palapa to the left, cocktails by the fire pit, dinner under the palapa to the right. Such a magnificent set up was inspiring. Could it not be used for a higher purpose? Thus came the idea of a little fishing tournament at Chileno Bay to raise money for needy children. Well, 21 years later and the event has become The Stars and Stripes Children’s Foundation, an established charity fundraiser, raising over 30 million dollars for seven children’s charities in Mexico and Southern California. The Stars are the children, who are the true stars of the event, and the Stripes are the striped marlin. 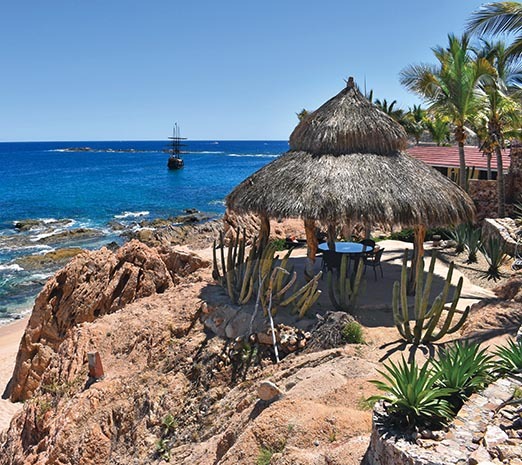 It has grown to include golf and live music, but the boats still start off every day of the competition from Chileno beach, while Villa Cielito, opened to all for the occasion, hosts beach activities for participants and their families. Do houses have qualities? Dicko and Debbie certainly think so. For them, Villa Cielito is a lucky house in the way that it came to their family, and in the way that it has given so much happiness, to them and to many others as well. By inspiring the charity, it has also been the source of much good. It is understandable when they say they will never sell it. 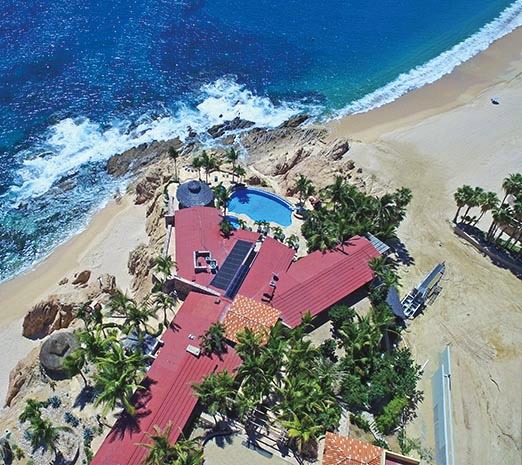 For me, Villa Cielito is precious as a testament of an earlier time in Cabo that is now gone. 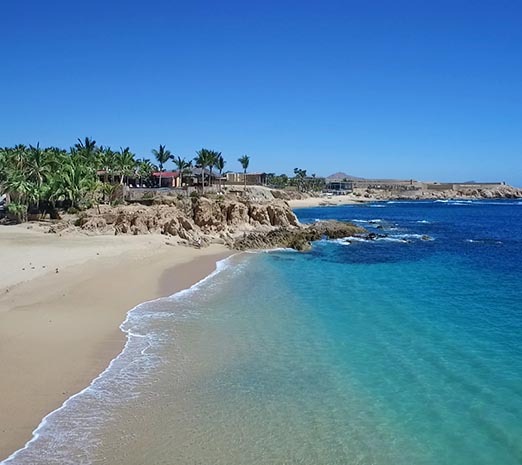 One can’t stop the march of progress, but I am happy that there will always be some things I love about Cabo that will endure- the incredible sea, the sky and the stars at night. 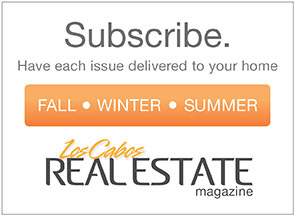 If you are interested in Cabo Corridor properties, click here.